Hello, crafty friends! Happy Monday to you all! I have some great news to share – participants playing in the a2z Scrapbooking challenges are no longer required to use Hero Arts products! Yay! Each month we will feature a ‘Digi of the Month’ which will be the prize offered to our randomly-chosen challenge winner. And to sweeten the pot, if you are the randomly-chosen winner and you have used Hero Arts products on your project, you’ll ALSO win a $20 gift certificate to the store! How cool is that?! 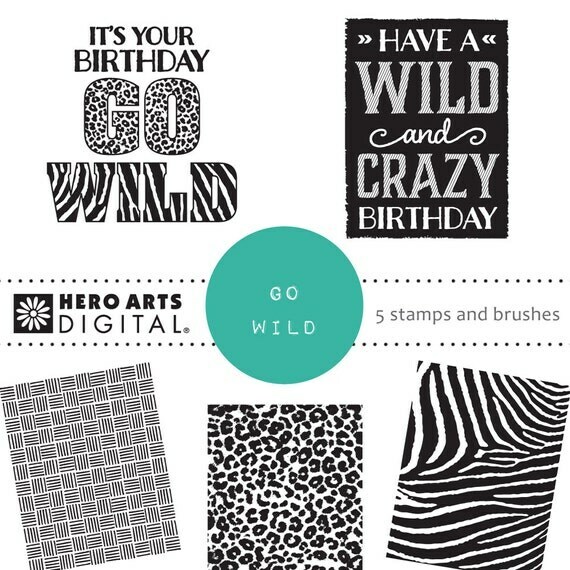 Our October Digi of the Month is the Hero Arts Go Wild Digital Kit. I volunteered to create a sample using the the October Digi of the Month, and created a fun one-layer all-digital birthday card using almost all of the images in the kit. This was super fun and super easy! I created the background using the Hero Arts Go Wild Digital Kit, resizing and recoloring all the images I used. I also used digital buttons from the Hero Arts Say It (in Pieces) Digital Greetings, resizing and recoloring those, too, as I applied them to my layout. After creating the layout I wanted, I printed it and trimmed it, then layered it on black cardstock and again on blue cardstock, and adhered it to the card base. I applied Morning Dew Crystal Drops to the buttons and a few other random places on the card front. I printed a sentiment for the inside from the Say It (in Pieces) Digital Greetings, trimmed it and adhered it to the inside panel which was also layered in black and then blue cardstock. Really loving how this turned out! Next Post 2017 World Cardmaking Day! What a great card! Love the theme with the background! 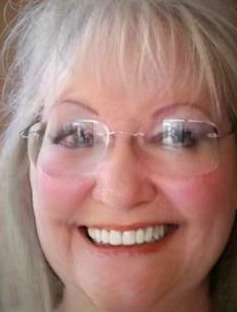 Thank you so much for entering our ATG challenge at Createful Heart Digis & Design this week. We hope you’ll join us again next time!